Fixed Unit, Wall Mounting Provision can be provided on request. 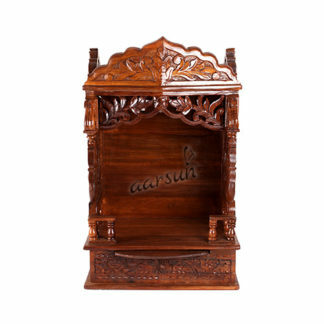 Aarsun Woods presents to you Handcrafted Wooden Mandir in Sheesham Wood and Teak Ply. We provide a wide range of designs handcrafted by skilled artisans in traditional polishing and finishing. This particular Temple is made keeping in mind the space / area available in modern homes. The Wooden Temple is large enough to keep a couple of idols or frames inside. In terms of usage, the Temple has a slider tray in front for placing Diya and a small full width drawer just beneath the slider tray for all other pooja essentials such as Dhoop and incense sticks. 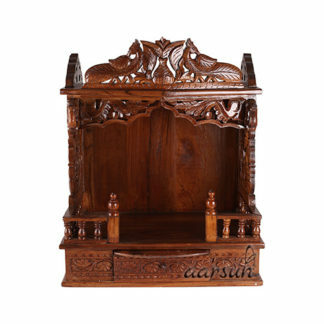 The Wooden Temple is handcrafted by skilled artisans with traditional floral carvings. Starting from the top, a beautifully carved out Mehraab is placed at the top with similar two other mehraab at the sides. The Mehraab has a fine floral carving which reflects the divinity of the Temple. The sides of the main Garbgriha are again carved out in peacock design in sitting position. Below the peacock carvings, lie small railing with pillars that extends even at the front of the Mandir. The front of the wooden Mandir consists of elephant trunks in welcoming position at the twio sides with a carved Mehraab just below the main top mehraab. The base consists of Slider Tray and a pull out Drawer. The Pull Out Drawer is full width thereby efficiently using the space below with traditional leaf and floral carving in front and sides. The overall look and feel of the Wooden temple is completely traditional keeping in mind the divine nature of the Temple. Please note that the Wooden Temple is made from Sheesham Wood except for the Base, the ceiling and the back portion which as made in Teak Plywood in order to strengthen the basic frame of the Temple. The Teak plywood provide a rigid support to the Sheesham Carvings thus strengthening the Temple for Safe Shipments. The Wooden Temple is shipped in a fixed manner in wooden crate packaging to safeguard the unit. One can place the Temple on the floor, or on a cabinet as required. Also, in case the unit is to be placed on the wall in a hanging position, we can provide wall mounting provision at the back of the Temple. The size of the Wooden temple can be altered as per your home decor and space requirement. Call us at +918192999135 / 8266888634 in order to book a customized unit for your home or for any other queries related to the Wooden Temple. 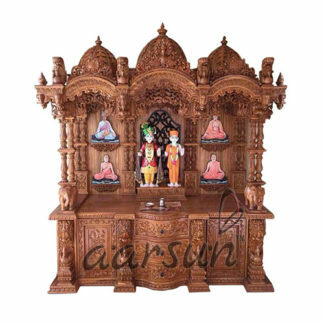 We are in the business of promoting Wooden Handicrafts for many years now and would be more than happy to provide you best possible assistance in selecting a Temple of your choice. Call now to get the Temple delivered right at your doorstep. COD option also available in major city areas. A wide range of Wooden Temple designs are available in Sheesham Wood Temple , also at Temple 76.